On February 9, 2015, my newest article was published by International Planning Studies and available online here. The article title is "The change and transformation of Indonesian spatial planning after Suharto's New Order Regime: The case of the Jakarta Metropolitan Area". The New Order Regime enacted the first law on spatial planning - the Spatial Planning Law 24/1992. The new system of Indonesian government after the fall of the New Order Regime enacted a new spatial planing law - the Spatial Planning Law 26/2007. The article examines the extent to which the change and transformation of spatial planning practices has take place in the Jakarta Metropolitan Area (JMA). The data sources for the article include federal and local spatial planning documents and interviews with ten people including planners and academicians. This blog post provides a description of the Spatial Planning Laws 24/1992 and 26/2007 and a summary of the changes of spatial planning practice in the JMA. The Spatial Planning Law 24/1992 stipulates the hierarchical spatial planning in Indonesia consisting of national spatial plan (RTRW Nasional), provincial spatial plans (RTRW Propinsi) and district spatial plans (RTRW Kabupaten and RTRW Kotamadya). All levels of government are required to make spatial plans for directing development in their respective regions. The spatial plan periods of each level of government are different. The periods of the national spatial plan, provincial spatial plans and district spatial plans are 25 years, 15 years and 10 years respectively. All levels of spatial plans shall be evaluated every 5 years. The Indonesian parliament passed the bill of spatial planning in April 2007 and replaced the Spatial Planning Law 24/1992. The new law, the Spatial Planning Law 26/2007, contains some provisions that are not included in the previous law. In accordance with the new decentralization laws, the Spatial Planning Law 26/2007 stipulates explicitly the authority of provincial governments (pemerintah propinsi) and of district governments (pemerintah kabupaten and pemerintah kota) in spatial planning. Such provision was not stipulated in the previous spatial planning law. The provincial and district governments have a broader authority in spatial planning. The provincial or district governments can stipulate new components in their spatial plan that are not stipulated in the higher level of spatial plans . The hierarchy of spatial plans and long term development plans according to the Law 26/2007 and the Law 25/2004 is presented in Figure 2. Long term development plans (RPJPs) and spatial plans (RTRWs) in each level of government can complement each other. If the RPJP of province (RPJP Propinsi) or RPJP of district (RPJP Kabupaten and Kota) precedes their respective RTRW, the RPJP will provide long term development guidelines for the RTRW. 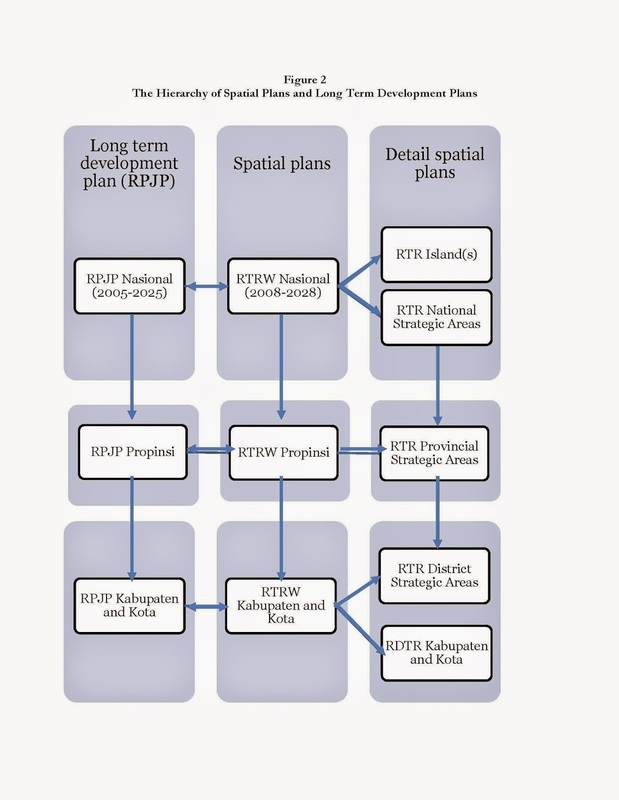 If the RTRW of province (RTRW Propinsi) or RTRW of district (RTRW Kabupaten and Kota) precedes their respective RPJP, the RTRW will provide long term spatial development guidelines for the RPJP. In the meantime, the RTRW of provinces or districts according to the Law 24/1992 did not have any guidelines from the long term development plans but only from the higher level of spatial plans (RTRWs) . The Spatial Planning Law 26/2007 also stipulates the spatial planning for islands (RTR Islands). The central government is responsible for RTR Islands. As of January 2014, six draft RTR islands including RTR Java and Bali Islands, RTR Sumatera Island, RTR Sulawesi Island, RTR Kalimantan Island, RTR Maluku and RTR Papua have been completed and are under review by the Cabinet Secretariat for the approval by the President of Indonesia. The spatial planning for islands is a new provision in the Law 26/2007 and was not stipulated in the Spatial Planning Law 24/1992. The new spatial law also takes into account the rapid urbanization in metropolises in Indonesia particularly in the Jakarta Metropolitan Area. The concepts of metropolitan area and megapolitan area are introduced in the new law. Such concepts are not included in the previous spatial planning law. A metropolitan area is defined as an urban area with a population of at least 1 million people. The Spatial Planning Law 26/2007 defines a megapolitan area as two or more adjoining metropolitan areas that have a functional relationship. The Spatial Planning Law 26/2007 has one new principle of the spatial planning that was not included in the previous law . The principle of accountability is included in the new law presumably to correspond with the enthusiasm of Indonesian people for a more transparent and accountable system of government. The new law also stipulates the minimal standard of services in spatial planning. Such provision is to ensure a good quality of basic services of spatial planning for the Indonesian people. This is a response to the dissatisfaction of the Indonesian people over the poor quality of services from the government during the New Order Regime. Another important provision of the Spatial Planning Law 26/2007 is the sanction provision for spatial plan violations. The sanctions for spatial plan violations include administrative sanctions and criminal sanctions. This law stipulates nine types of administrative sanctions including written warning, temporary activity termination, temporary service termination, location closure, permit revocation, cancellation, building removal, land use reconversion, and administrative charges. The criminal sanctions in this law include imprisonments up to 15 years and penalties up to Rp. 5,000,000,000.00 (approximately US$ 500,000). The Spatial Planning Law 26/2007 also validates the importance of public participation in spatial planning. The new law provides more detailed regulations than the previous spatial planning law including rights, obligations and the forms of public participation in spatial planning. Such provisions correspond with the more participatory system of government after the fall of the New Order Regime. After the end of the New Order regime, spatial plan violations are mostly associated with local governments that exploit their assets and natural resources for generating more local revenues. The more democratic government following the fall of Suharto’s New Order regime had no impact on spatial plan violations. The provision of sanctions for spatial plan violations has not been fully enforced. The provision of zoning regulations has not been supported by zoning inspectors to effectively enhance the development control in Indonesian cities. The transformation of spatial planning practice toward a more democratic and accountable one as a result of the enactment of the new spatial planning law is not an easy and instant process. The implementation of the new spatial planning law in the JMA involves three factors including hindrances, opportunities and forces as shown in the table below. The transformation of Indonesia into a more democratic government created opportunities for producing an effective spatial planning. However, a more decentralized government also created hindrances for an effective spatial planning implementation in the JMA. The ineffectiveness of spatial planning in Indonesian including the JMA is also associated with the centralized and arbitrary political culture from the New Order Regime and the clientelism governance culture that still pervade Indonesian communities. Note: I am pleased to share free access to the article from the link below for the first 50 eprints.